Swimming is not an activity that you learn and then never do again. Learning to be relaxed in the water and some rudimentary swimming strokes will prepare your child to swim on vacations, at camp, at pool parties, on a school or club team, for cross-training, or in a triathlon, and many other activities. A few lessons now open many doors later. There are few activities where you can be face-to-face and skin-to-skin with an infant or toddler. The smiles that come from the songs, games, toys, and mini-successes in the water are priceless. For working parents, parent-child classes are great ways to reconnect with your child on weekends or after work. Swimming is one of the few ways for infants and toddlers to be fully mobile. 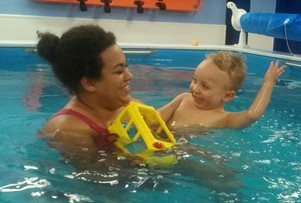 It’s not unusual for swim coaches to see a child swim before he can walk. By using their legs, they can get from coach to parent on their own. For those who have older children still trying to get command of their bodies, the water’s buoyancy is more forgiving than gravity and can build self-esteem that is harder to come by in land sports. To a person, every adult I teach to swim says, “I wish I would have learned to swim as a kid.” When it comes time to learn competitive strokes, those who are relaxed in the water always pick up things faster. As you get older fear and the analytical mind must be silenced to learn. It’s never too late to learn to swim, but it’s easier to pick up when time is not a factor and fun is the goal. I try not to be alarmist about water safety, but it’s a fact that anyone can drown in a bathtub filled with an inch of water. It’s important for children to learn to wait for a parent or coach’s cue, to understand the dangers of water, to learn how to call for help, to learn when to wear a lifejacket, and other safety skills. Accidents can happen, and the ounce of prevention rule truly applies here. Get started early in the year with swim lessons, so your child is ready to swim when school gets out. I hope to see you all at the pool!